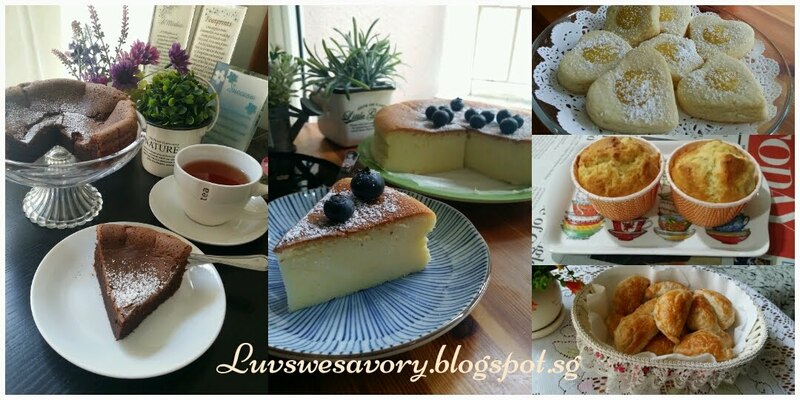 It has been almost two years that I'd last baked a so-called decor chiffon cake here with extra making of chiffon sheet for cut-out designs. Finally! 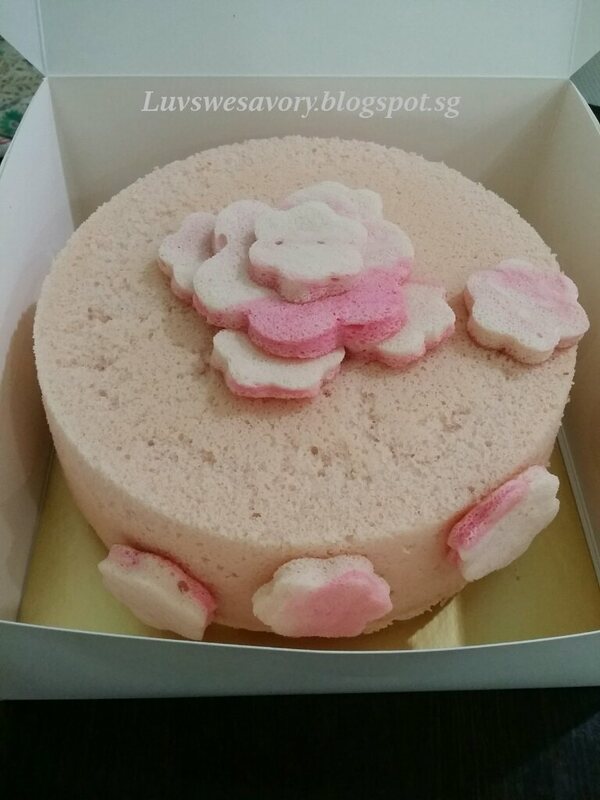 Baked a simple decor chiffon cake with some cut-out flowers. 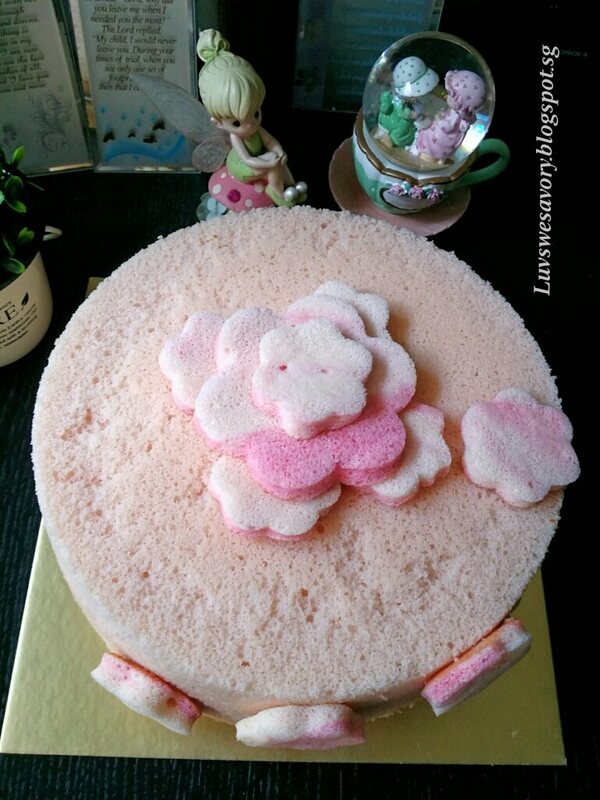 So glad that it turned out fluffy tall, pretty sweet looking and the texture is so cottony soft. Baked this for a dinner event and blessed it was served as a birthday cake. Below my slight adjustment made. 1. Preheat oven to 160°C. Place a tray of water under the lowest rack for steam baking. 3. In a clean mixing bowl, whisk the cold egg whites and cream of tartar till foamy using the electric stand mixer. Gradually add in caster sugar in 3 separate additions and beat till stiff peak, formed into a firm meringue. Transfer to a big bowl and chill in the fridge. 4. In the same mixing bowl, cream together the egg yolks and caster sugar until pale and thickened using the electric mixer (about 3 - 4 minutes). Add in canola oil, strawberry yoghurt drink and vanilla extract and whisk till combined. 5. Sift in cake flour and whisk again until mixture is well combined. Add in 1 - 2 drops of food colouring and mix well. 6. Using a *hand whisk or a spatula, gently fold in the egg whites to the egg yolks mixture in 3 batches until it looks evenly mixed (no streaks of meringue). 7. Pour the batter into the un-greased chiffon pan. Smooth the top evenly with spatula. 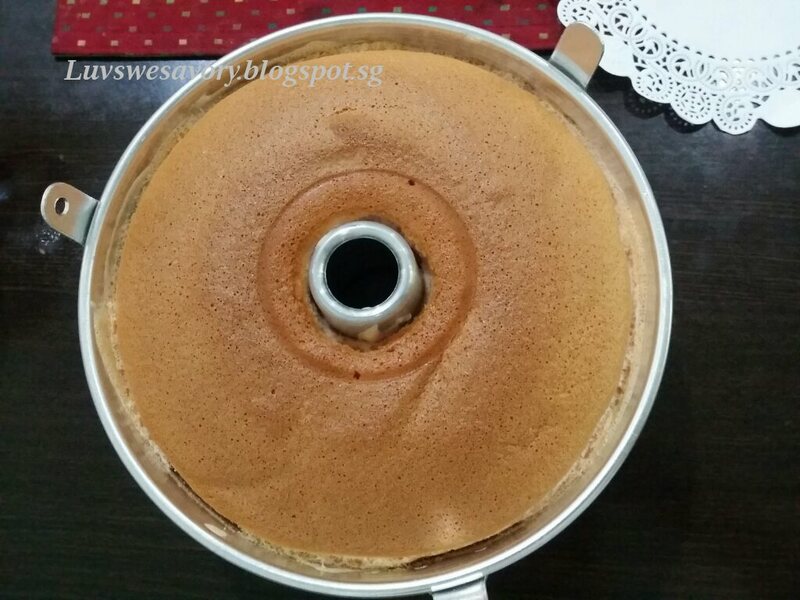 Lightly tap the pan 2 - 3 times on a table top to get rid of any trapped air bubbles in the batter. 8. Bake the chiffon cake for 15 min at 160°C and then at 150°C for 10 mins and 140°C for 30 mins. Test with a skewer inserted into the centre if it comes out clean. 10. Immediately invert the pan to cool completely before unmoulding the cake from pan. To unmould cake by hand, gently pull cake from the sides of the tube pan. Turn the cake pan over and press down on the bottom firmly to dislodge. Gently pull the cake from the base around the edge and around the whole cake. Continue to lift up the cake and moving inwards until you reach the tube. Cut-out flowers strawberry sheet cake adapted from: Loving Creations for You, with modification made from the pandan sheet cake. 1. Lined a 25x25 inch baking sheet with parchment paper, need not grease and set aside. 2. Preheat oven at 160°C and position the rack in the center. 4. In a clean mixing bowl, whisk the cold egg whites and cream of tartar till foamy using the electric stand mixer. Gradually add in caster sugar in 2 separate additions and beat till stiff peak, formed into a firm meringue. Transfer to a big bowl and chill in the fridge. 5. In the same mixing bowl, whisk together the egg yolk and caster sugar until pale and fluffy with manual whisk. Add in canola oil, strawberry yoghurt drink and vanilla extract and whisk till combined. 6. Sift in cake flour and whisk again until mixture is well combined. Divide the batter into two portions. Add 1 drop of red food colouring in one portion and mix well. 7. Divide the meringue into 2 portions. Gently but quickly fold in the meringue into the 2 batters with a manual whisk in 2 batches until it looks evenly mixed. 8. Pour the two batters on the prepared baking sheet, briefly made few marbling effect with the spatula. Bake for about 15 mins at 160°C (do not over bake). 9. Flip over onto cooling rack, remove the parchment paper to cool completely. Cut out some flowers with floral shape cutter. 10. To assemble, melt a few pieces of marshmallows with small amount of water, mix until cream like texture with spoon. 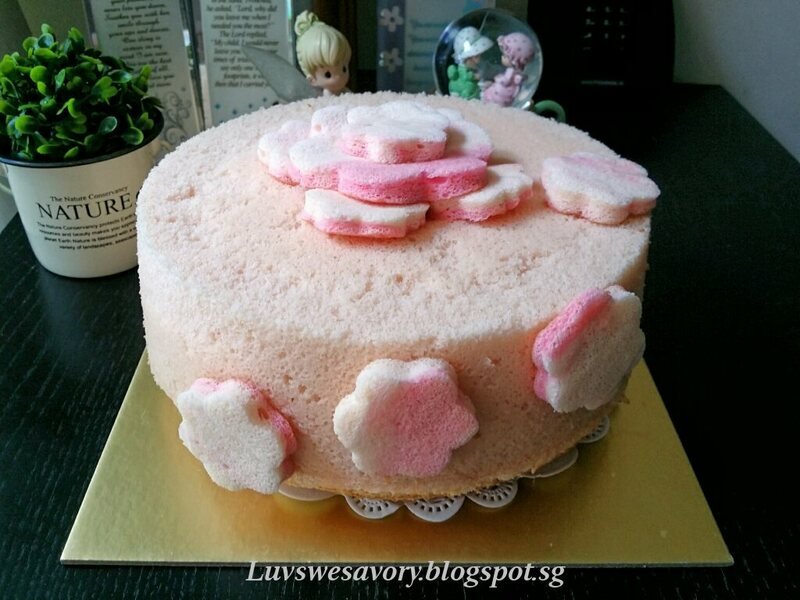 Apply small amount and "glue" the flowers onto chiffon cake and decorate as you like. I'd forgotten to sprinkle some sparkling sugar as rushed for the event. 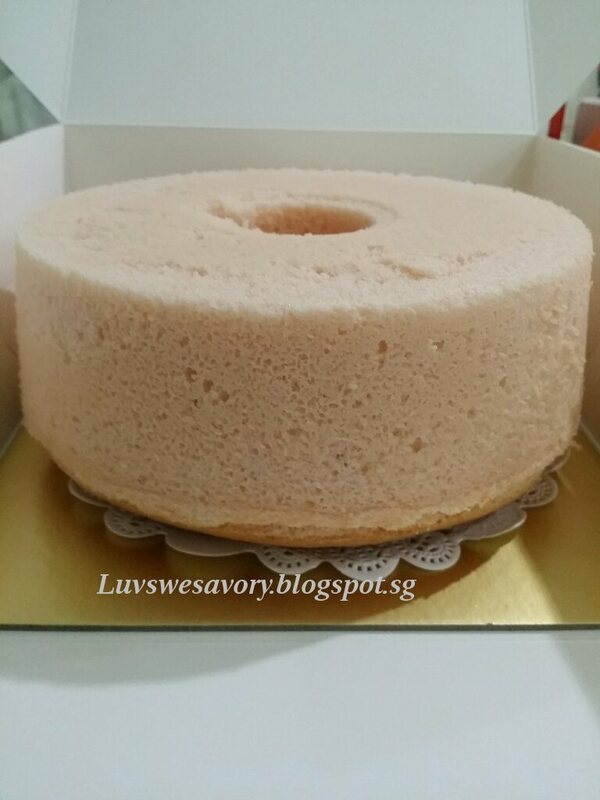 When box it up, the height of the cake almost reach it's cover. 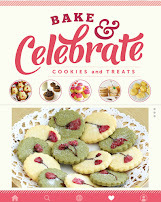 Happy that it was very well received. A simple decor chiffon cake with some flowers in pastel colours to usher into the new year.. Goodbye 2016 .... Welcome 2017 ! Here's wishing you and family a Blessed and Happy New Year ! Well done Karen, thumbs up for you! Wish you and your family Happy 2017! What a gorgeous cake Karen, you are such a wonderful baker. Happy New Year! Happy New Year, Karen! 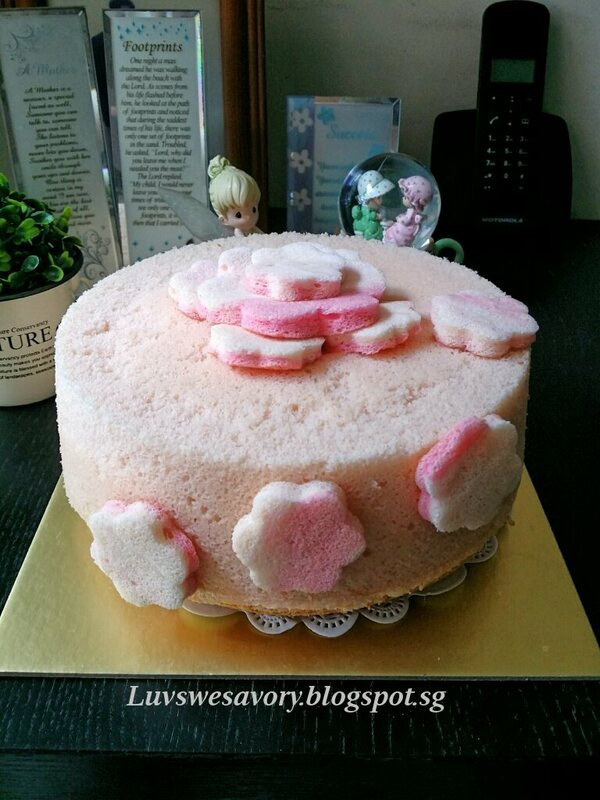 What a pretty pink cake :) I love the flower cut outs. Have you heard of the term 'Green Thumb'? You have the Cake Thumb, Karen. 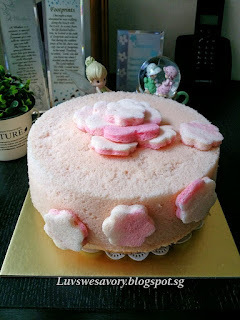 This is a beautiful cake!